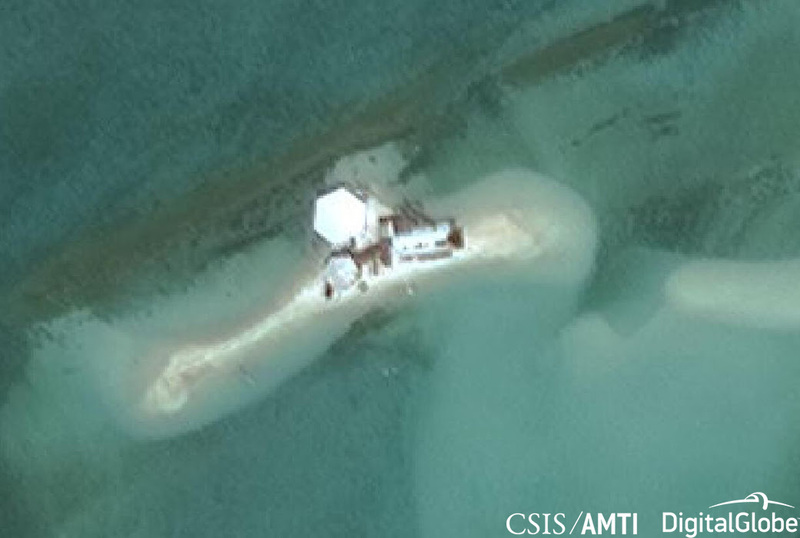 Satellite imagery from December 13 and 14, 2018 show a barge anchored off the west coast of the island with excavators and a bulldozer in the process of depositing and grading sand to extend the small existing causeway to the edge of the reef—presumably creating the beaching ramp referred to by Lorenzana. This would allow ships with deeper drafts to deliver supplies directly onto the island, rather than the current process of offloading onto smaller boats in order to ferry supplies over the reef. 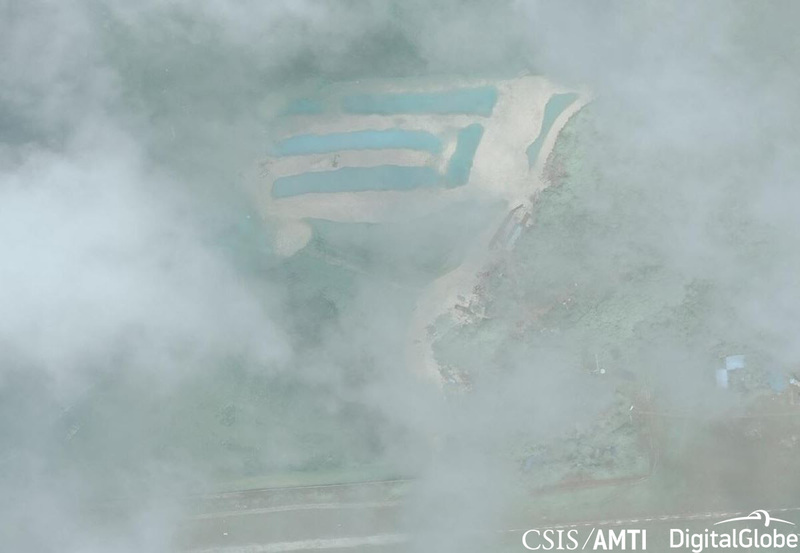 The new construction started sometime in early to mid-December, as no apparent work is visible in imagery dated December 3. 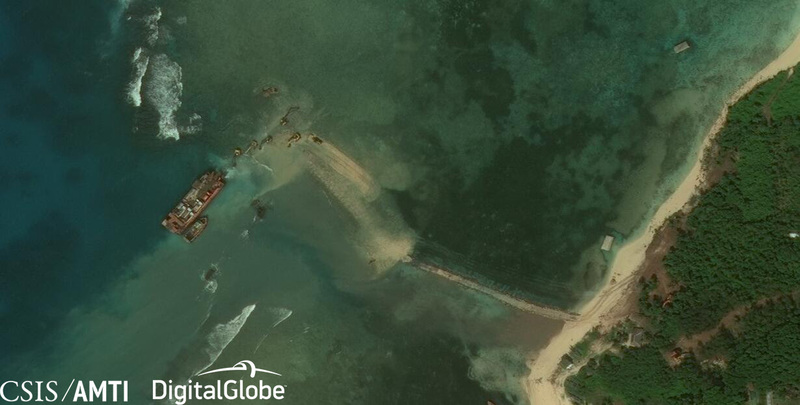 More recent imagery from January 11 and 26 of this year show that the reclamation work is more ambitious than a simple beaching ramp. 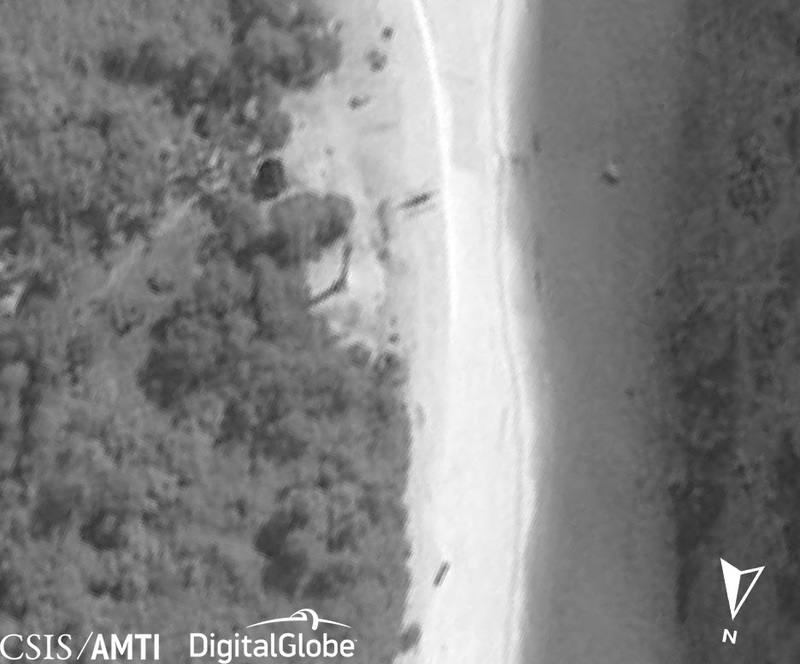 Both images are partially obscured by clouds, but they reveal excavators depositing sand over an area of approximately 8 acres, or more than 32,000 square meters, to the north of the existing causeway. It seems unlikely that this area of new landfill, the equivalent of about three city blocks, is meant only as a staging area for materials and equipment brought in to repair the runway. Lorenzana has previously said that the Philippine government plans to construct a fish port, desalination plant, solar power array, improved housing, and marine research facilities on Thitu. 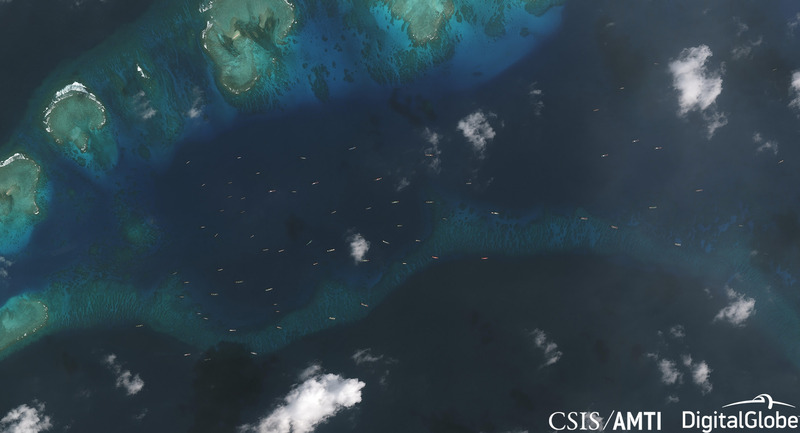 China has responded to this new construction by deploying a large fleet of ships from Subi Reef, just over 12 nautical miles southwest of Thitu. These include several People’s Liberation Army-Navy (PLAN) and China Coast Guard (CCG) ships, along with dozens of fishing vessels ranging in size from 30 to 70 meters. 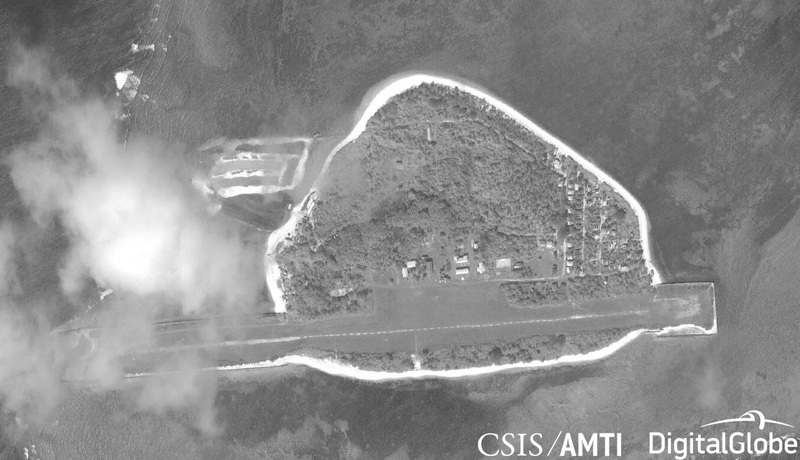 A handful of Chinese vessels have operated in the area between Subi and Thitu since at least July 2018, likely in response to the initial Philippine effort to start runway repairs last May. But their numbers increased to at least 24 on December 3, just before the current construction operations began. 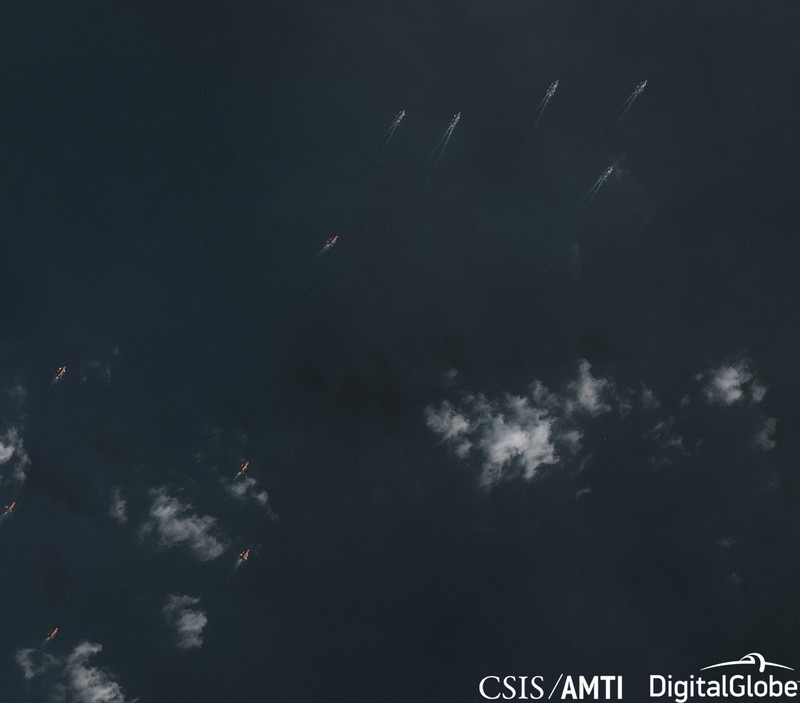 In five subsequent satellite images captured from mid-December to late January, their numbers fluctuate, reaching a high of 95 on December 20 before dropping to 42 by January 26. The fishing boats have mostly been anchored between 2 and 5.5 nautical miles of Thitu west of Thitu, while the naval and coast guard ships operate slightly farther away to the south and west. 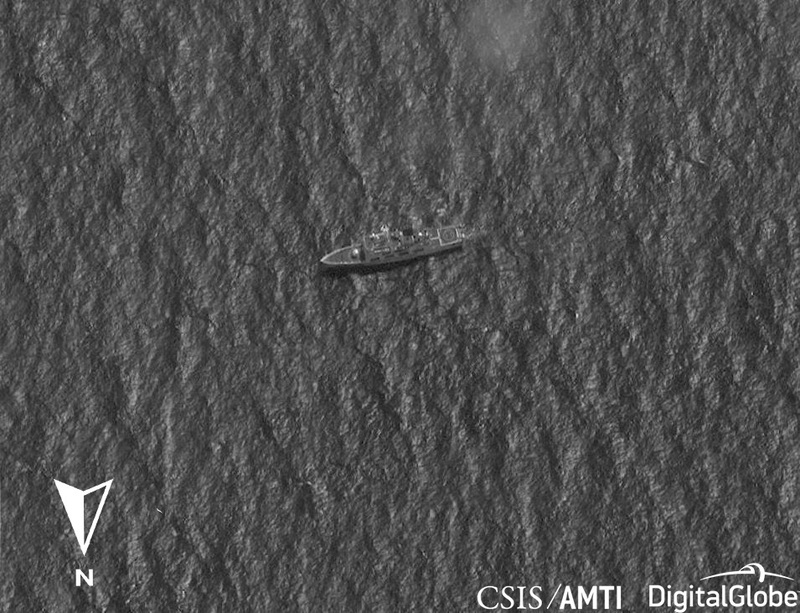 This deployment is consistent with prior examples of China’s “cabbage strategy,” which employs concentric layers of fishing, law enforcement, and naval vessels around contested areas. 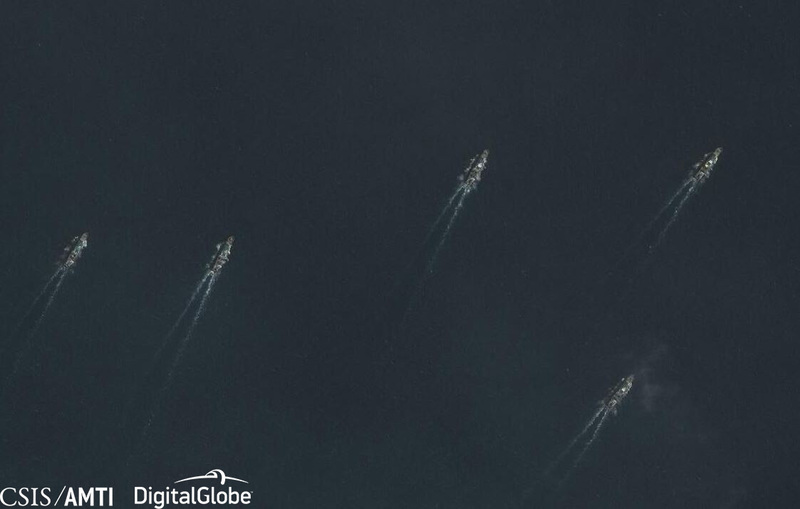 Two Chinese government vessels are visible in the December 20 imagery. They appear to be a PLAN Type 053H1G (Jianghu V-class) frigate and a CCG Type 818 (Zhaoduan-class) cutter. 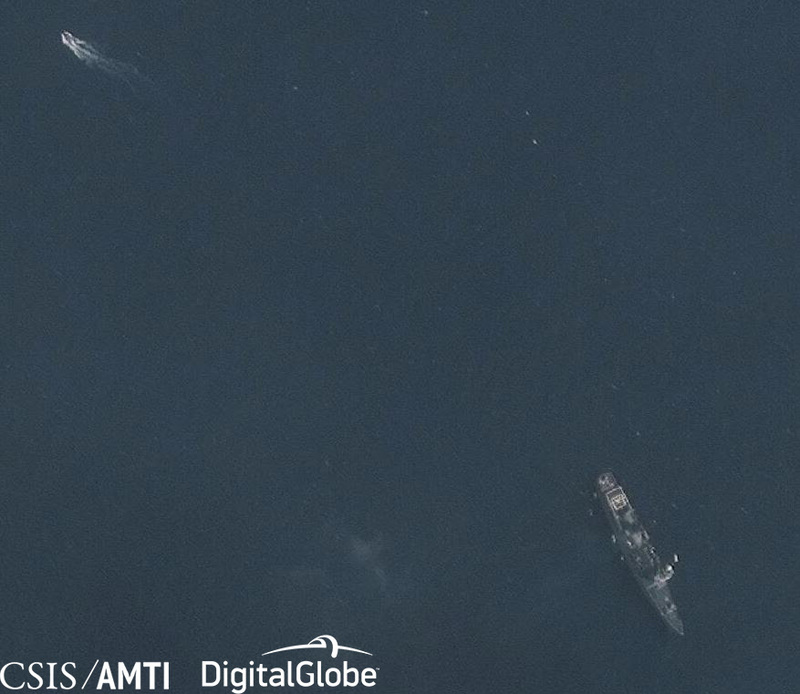 At the same time, one of the Philippine Navy’s flagships, the BRP Ramon Alcaraz, can be seen to the southeast of Thitu just over 7 nautical miles from the PLAN frigate. The ship is one of three former Hamilton-class U.S. Coast Guard cutters transferred to the Philippines in recent years and rechristened Gregorio del Pilar-class frigates. The vessel must be the Ramon Alcaraz; the BRP Andrés Bonifacio was engaged in a community relations exercise with the U.S. Navy in Olongapo that day, and the BRP Gregorio del Pilar itself has remained in Subic Bay for repairs after running aground on Half Moon Shoal in the Spratlys last August.The fishing vessels display all the hallmarks of belonging to China’s maritime militia, including having no gear in the water that would indicate fishing activity and disabling their Automatic Identification System (AIS) transceivers to hide their activities (for instance, on December 20 only 1 of the 95 or more vessels engaged in the deployment transmitted AIS data). Lorenzana said in November that China’s ambassador to the Philippines had previously urged him to cancel the planned upgrades. 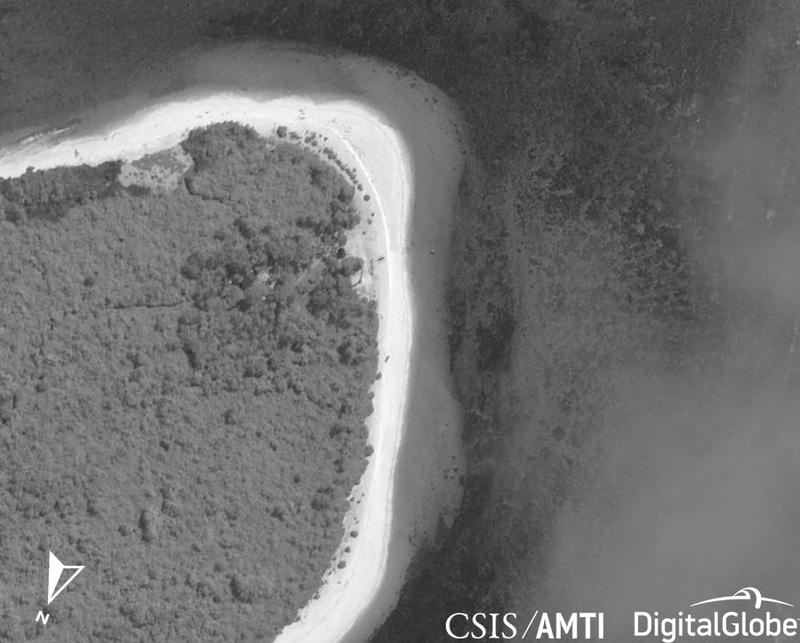 A similar Chinese flotilla surrounded Thitu in August 2017, when Filipino fishers attempted to erect shelters on a nearby sandbar. 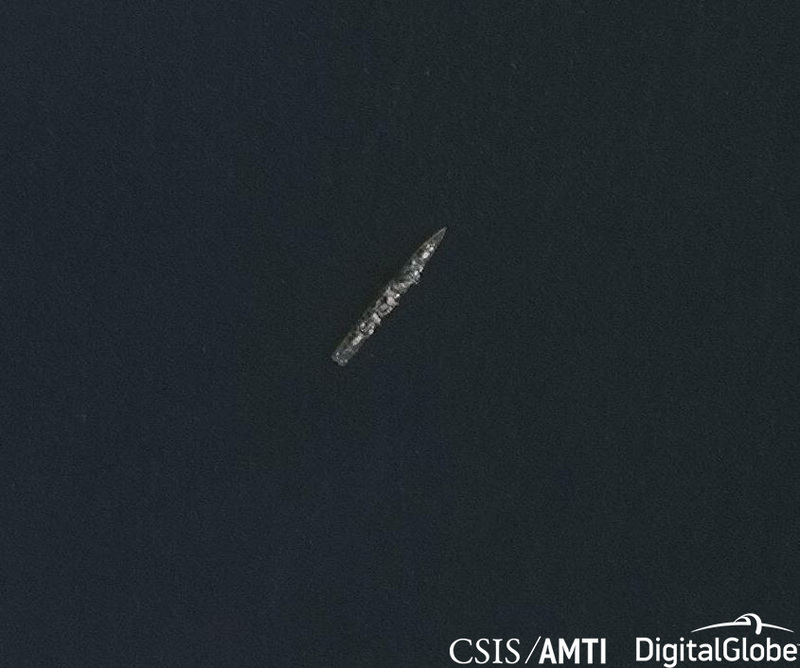 Imagery from January 11 reveals one PLAN and one CCG ship, likely a Type 056 corvette and a Type 718B cutter, near Thitu. 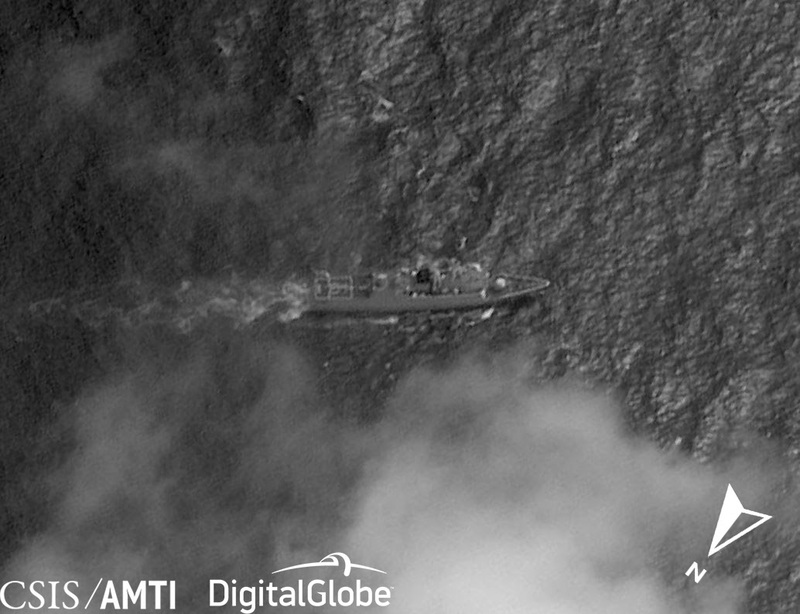 By January 26, satellite imagery shows only a CCG Type 718B. The Ramon Alcaraz is not visible in either image from January. 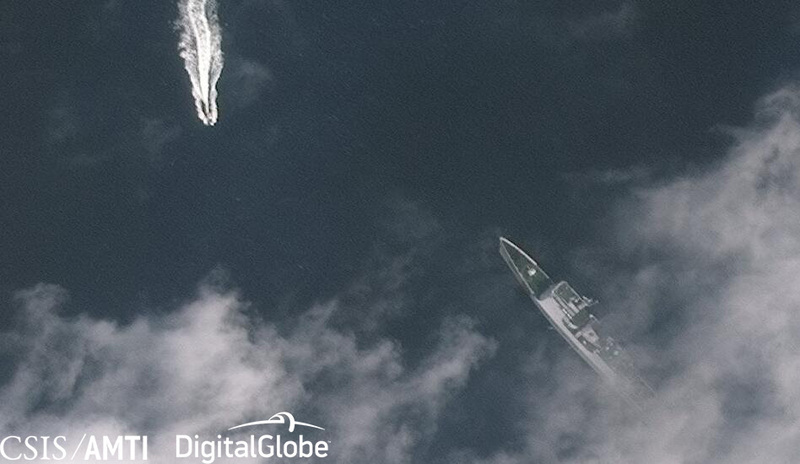 The drop in the number of government vessels, mirroring the reduction of the militia presence, suggests Chinese forces have settled into a pattern of monitoring and intimidation after their initial large deployment failed to convince Manila to halt construction. 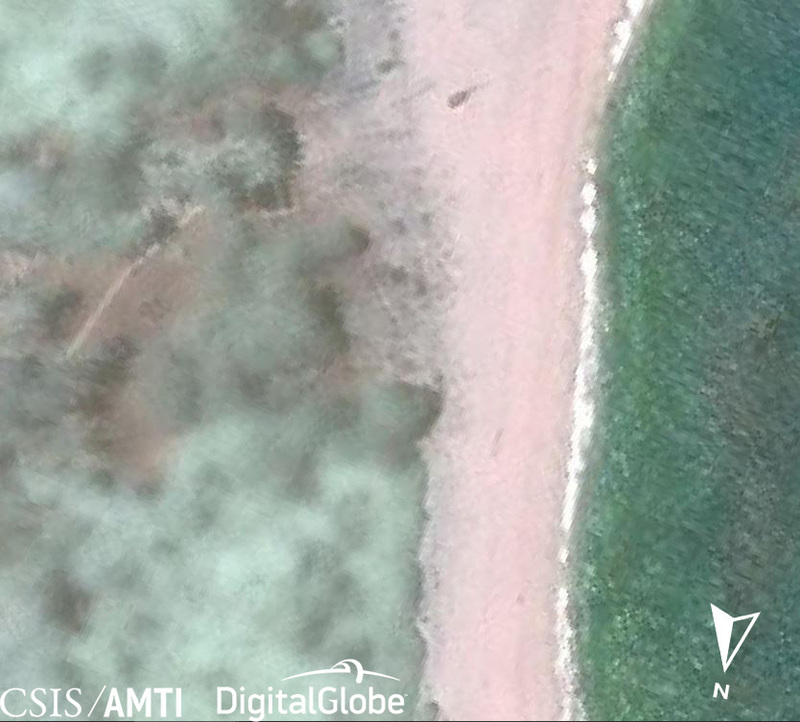 While Thitu is expected to see the lion’s share of new Philippine construction, some of its other Spratly Island outposts are also seeing minor upgrades. 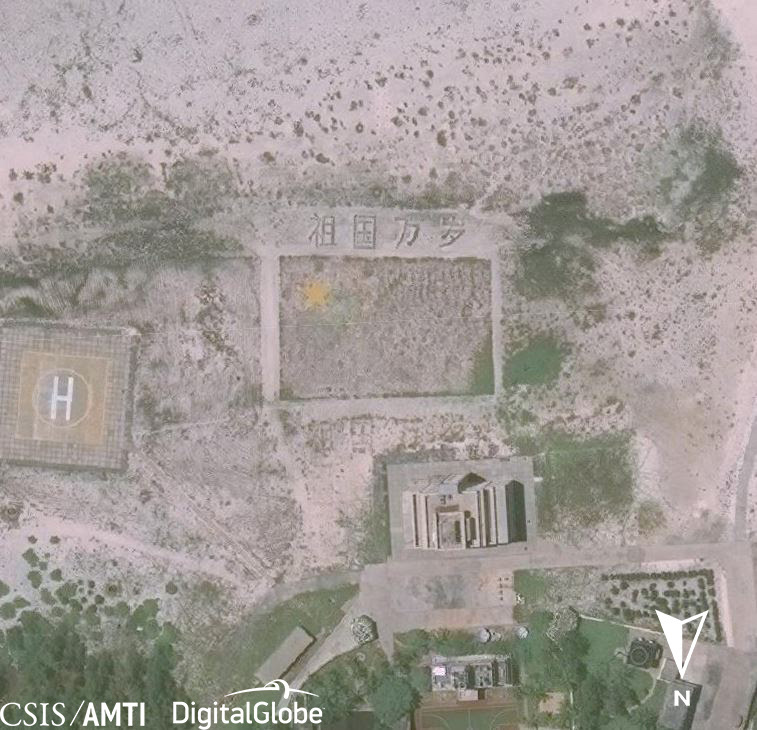 In May 2018, AMTI noted the construction of new shelters at Commodore Reef and Loaita Cay (often confused with nearby Lankiam Cay) and the installation of a helipad on Nanshan Island. At that time, the Philippine government also announced plans to erect five lighthouses in the Spratlys. Between May and November 2018, one of those planned lighthouses was built on the western shore of West York Island. Meanwhile on Loaita Cay, the roof of the shelter built last year has received a patriotic paint job, displaying the Philippine flag. Manila isn’t the first to use roof art to announce its claims to passing planes and satellites. 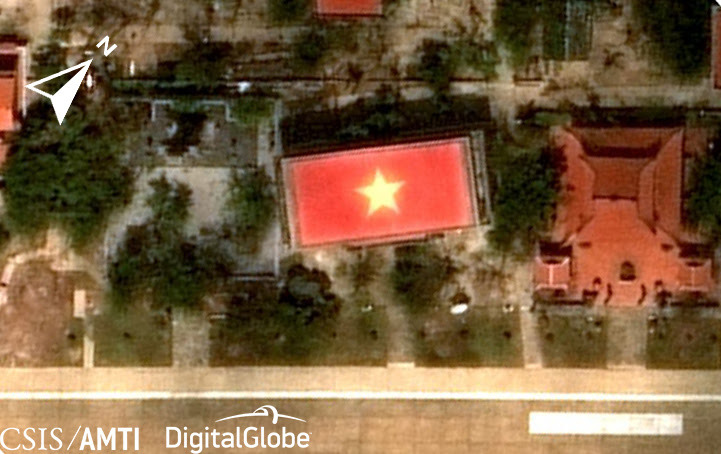 For years, the Vietnamese flag has decorated a large building on Spratly Island, while an even larger Chinese flag is stamped on Triton Island in the Paracels alongside the characters 祖国万岁 (Long live the motherland). 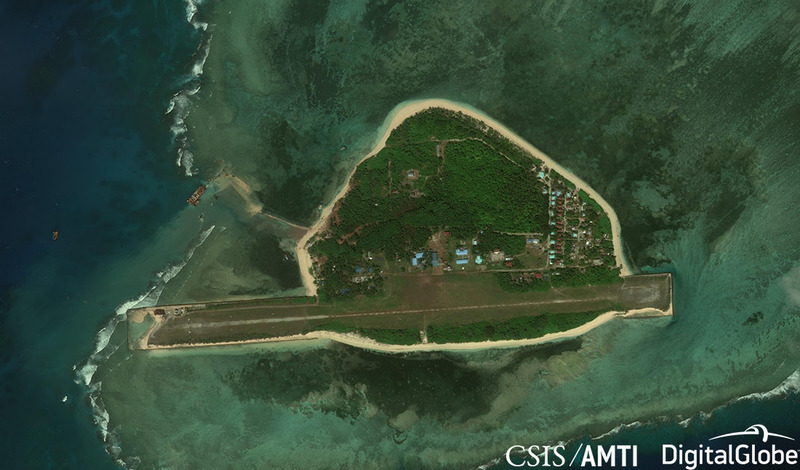 Manila appears intent on upgrading its facilities in the Spratlys despite any détente or objections from Beijing. But those plans continue to face delays and their scope is much more modest than those undertaken by China or even Vietnam. 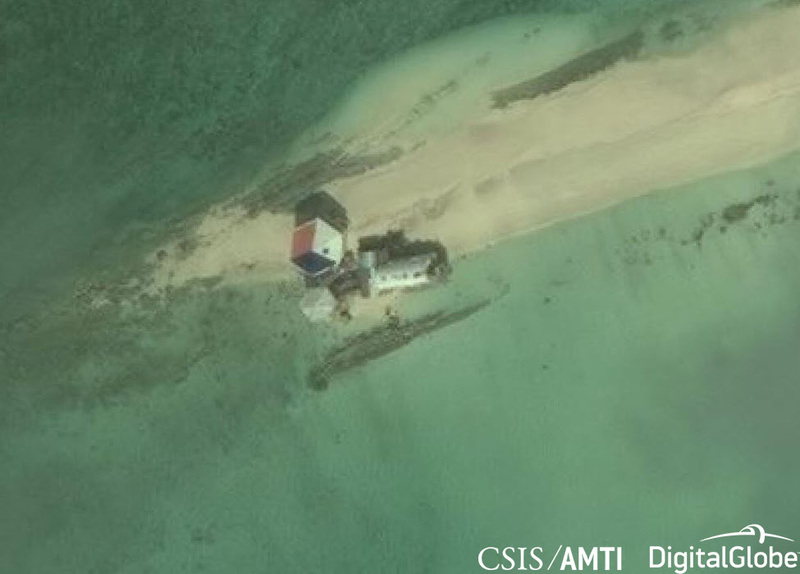 At Thitu Island, the administrative center of the Philippine claim in the Spratlys, the reclamation work being undertaken involves construction equipment depositing sand shipped in from elsewhere. This is a much less environmentally destructive method than China’s large-scale island building in the Spratlys and Paracels, which employed suction-cutter dredgers to grind up the reef surface and build outposts with the resulting sediment. Once completed, the Philippines will have created 8 acres of reclaimed land in the Spratlys in recent years, compared to about 120 acres by Vietnam and 3,200 by China.